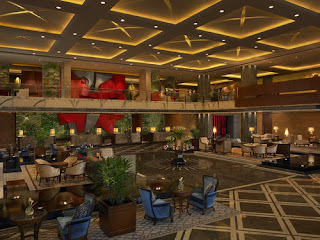 The recent Delhi trip was my first visit to a city involving stays in two five star hotels in succession. When I speak of Delhi, I'm referring to the National Capital region, including Gurgaon, for it was at Gurgaon's Leela Kempinski that I first landed. 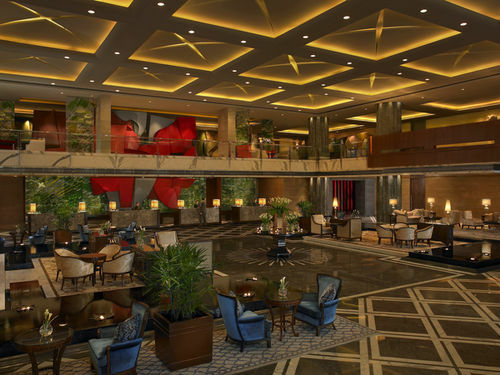 The hotel's embedded in Gurgaon's Ambience Mall, and came on board after architectural plans were drawn, so its exterior includes a standard shopping mall glass facade. The inside felt pleasant enough but unremarkable. 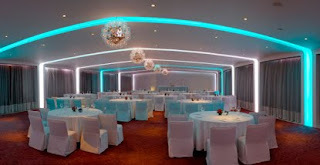 I later learned Rajeev Sethi had put together a selection of artwork in the lobby and rooms. I'm afraid I didn't notice any of this art in my walks across the marble floor to the glass door in the mornings, or my walk across it to the lift in the evenings. What I did notice was the number of people saying namaste to me at every point: the chap who opened the car door; the two security men; two women just inside the door; two males flanking the lifts; and any other staffer who happened to be within ten yards of me at any time of day or night. Delhi has completely gone over to the namaste greeting. In Bombay they still do 'welcome', 'good morning', 'good afternoon' without reflexively folding hands. The room was very comfortable with a pleasant view over some scrub-like forest. All fixtures worked, and the wifi was fast, though the 550 rupee price tag for 24 hours was a bit hard. What I didn't understand was the wooden floorboards, which creaked below me every time I walked across the room, and creaked above me whenever the guy upstairs moved across his. There's really no excuse for using wooden floorboards in this day and age: tile or stone does perfectly well, and if you're worried about cold floors, a carpet's far better than wood. Strangely the second hotel I stayed in used wooden floorboards as well: a peculiar fixation appears to have gripped the hotel designers of Delhi. This second hotel was The Park near Connaught Place. It claims to be a five-star hotel, but really is not. Like, I checked in at night, and I suppose the windows had been kept open by the previous occupant or by staff, and so the room was really cold. I turned the climate control to 25 degrees, but it didn't help. I called reception and was told the hotel had no heating, the thermostat was there only to adjust the level of cooling. They gave me a portable heater to keep the temperature comfortable, and I kept the AC switched on to ventilate the room, but really, a five-star hotel in Delhi ought to have central heating, no? The lobby of The Park is done in retro-sixties style: bright, velvet-y biomorphic sofas, bead curtains, that sort of thing. Problem is, the place is showing its age, giving the lobby the feel of a fancy bordello. The Park is a tourist's hotel, unlike the Leela which is full of suits; the senior citizens I saw looked quite happy. Maybe the decor reminds them comfortingly of what was cutting edge in their teenage years. I was less than happy. The rooms are small; the water in my bathroom seeped under the glass partition separating shower from toilet; there's no wifi, only a slow ethernet connection at an extortionate 450 rupees plus taxes for an hour and 800 plus taxes for a day; the staff looked a bit too eager for tips; and the muffins at breakfast had a kerosene flavour. 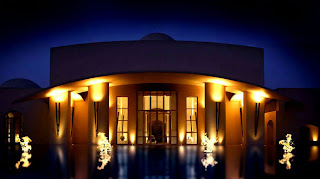 The hotel that seriously impressed me on this trip was The Trident, Gurgaon, which I visited for a late night drink with a friend. 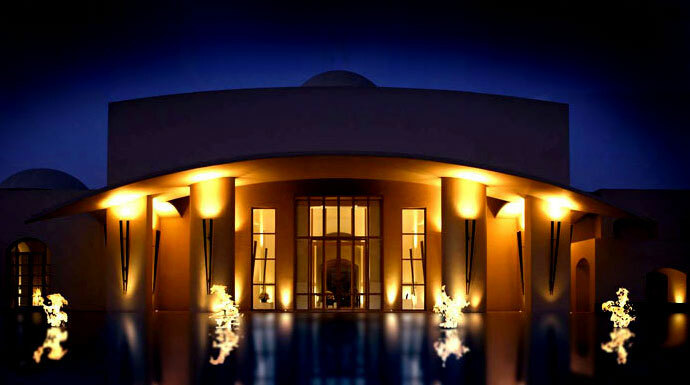 Designed by a Thai architect, the hotel makes use of traditional Indian structures such as the bangla roof, but within a spare overall plan, not minimalist by any means, but calm, reflective. Entry at night is spectacular: one walks through a gate to a black rectangle of water within which gleam four fires. To one side is the dramatically lit entrance to the reception area. Going back to the Delhi versus Bombay theme, here's another reason Delhi scores: it has lots of interesting modern and postmodern architecture, while hardly anything good has been built in Bombay after the art deco era.